One of the best kept secrets of La Ceiba is the hot springs in La Ceiba, known as the Sambo Creek hot springs. Here, hidden in the jungly mountains of Nombre de Dios National Park, high above Sambo Creek, you can find a spectacular hot spring in the middle of the jungle. On a relatively cool day, like today, you can see the tell tale signs of the hot springs in La Ceiba from afar, as the steam flowing up to the sky can be clearly seen from afar. These hot springs in La Ceiba sprout from the underground at a boiling 360 degrees Fahrenheit. They flow down the mountain side in lovely, hot water waterfalls. These mix naturally into a cold water creek, creating natural pools that are absolutely ideal to relax and soothe both, your body and soul. The hot springs in La Ceiba are really easy to get to! If you are coming from La Ceiba, you must pass the entrance into Sambo Creek. This is really easy because there is only one entrance into this Garifuna Community. Shortly after the entrance, continuing on the road towards Trujillo you will go over a small creek. About 200 yards past it you will pass the entrance to Hotel Villa Helens and Hotel Canadien on your left. Continue another 200 yards and you will see a sign indicating the entrance to Glendas Thermal Hot Springs. Do not enter here; continue a short 30 yards past this entrance and you will see a small sign that reads Sambo Creek Canopy Tour and Hot Springs. This is the entrance to the hot springs in La Ceiba. The path is a narrow all weather road that you can travel through in any vehicle. Follow the road up until you see a sign that says Canopy Tour parking. Park here, DO NOT attempt to continue along the road unless you have a four wheel drive vehicle with good power, as the road back requires both! Park your car and walk about 80 or 100 yards, following the signs. A large “Champa” or thatched roof structure is clearly seen and operates as the headquarters for the Sambo Creek Canopy Tour and Hot Springs. Entrance fee for the Hot Springs is $40 US dollars per person. The service includes a 30 minute massage, a mud bath and time to relax in the hot springs. Allow about 1 ½ hours per couple for the service. You will love the experience of being in the middle of the jungle. Relax and listen to the small creek flowing down the mountain. 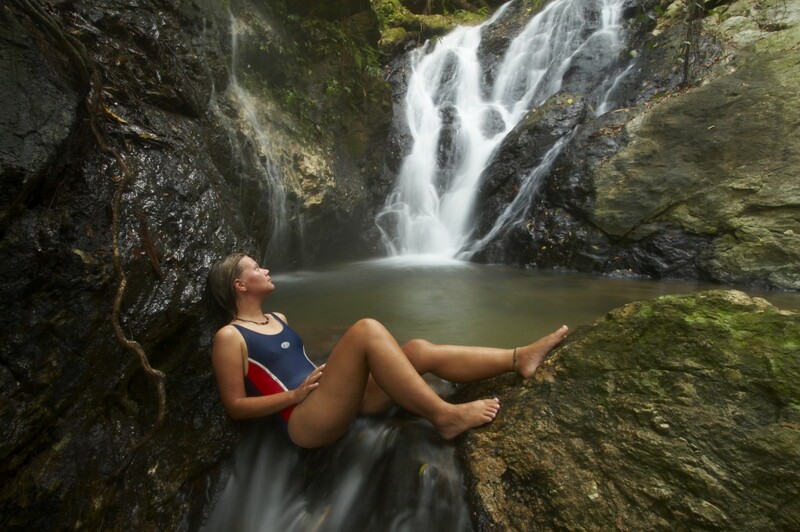 Soothe your body in the small waterfalls and pools and relax in nature. You will not find a nicer, more romantic, relaxing setting that what you will find at these hot springs in La Ceiba. If you are part of a small group, they will pick you up and take you their facilities. You can also combine the hot springs with the Canopy tour. All at the reasonable price of only $65 USA dollars.